Open Studios is an annual event that occurs over three days in October welcoming 1800 visitors to our studios, exhibitions, and printshop. 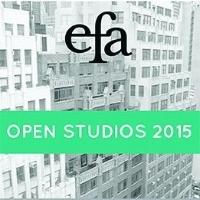 EFA OPEN STUDIOS is an annual event of the EFA Studio Program that invites the public to come explore and interact with our member artists in the intimate setting of their studios. It is an opportunity to see the most recent works by artists at the site of their origin and to gain meaningful insight into their process of creation. The EFA Studio Program is a vibrant and diverse community of over 75 artists working in a wide range of media and artistic sensibilities. All are professional artists with an established studio practice and recognized career. Rarely can curators, collectors, dealers, artists, and art lovers see so many internationally recognized artists working under one roof in Midtown Manhattan. And our friends at Tito's Handmade Vodka & Sierra Nevada Brewing Co.